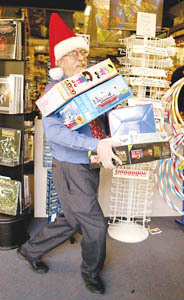 Boxing Day: Game-A-Lot's Frank Kaehler is ready to toy with holiday shoppers. Do you remember the brand name of your blocks? Do blocks even have brand names? According to the Toys "R" Us website, this year's bestselling toys are a battery-manufacturer's dream. Leapster by LeapFrog, an interactive learning tool, is hot, as is the Video Now video player by Hasbro. Go-Go My So Real Walkin' Pup and the Radio Controlled Vertigo by Tyco RC are among the most-requested toys, and let's not forget the various video-game consoles and their assorted games. If it doesn't light up or make noise, who needs it? Downtown toy stores, however, tell a different story: it's all about old school. At Treehouse Toys, the bestseller of this holiday season has been a big wooden pirate ship ($125). "The recent pirate movies have had a lot to do with that," says Janet Murray, owner of Treehouse Toys. Dress-up clothes (starting at $12), including wooden swords and shields, are popular, too. Treehouse Toys features--what else?--a cunning wooden treehouse (starting at $59.99) with rope swings and attachable levels, as well as classic wooden trains that can be customized with additional cars and tracks (starting at $80). Isn't it every kid's dream to wake up on Christmas morning and find a train set looping around the tree? But it's not just kids who are buying these things--adults take one look at the wooden toys and fall in love. Most of them are imported from Germany, and are of a quality not found in most mainstream toy stores. "These are things you can pass down to your grandkids," says Murray. Treehouse has other things you might expect to find at an old-fashioned toy store, like the ever-popular baby doll. "The everyday baby doll is hard to find," Janet says. "If it doesn't talk or have eyes or light up, you don't see it on the shelf." Some of Treehouse's dolls, ranging in price from $55 to $138, are almost works of art--they're handmade and imported from Germany. Another old classic that's still a hit: the yo-yo ($3.49), says Frank Kaehler from Game-A-Lot. And the Rubik's Cube ($9.99) is back, thanks to a resurgence of all things '80s. But the most surprising break-out toy has got to be the Oball ($6.95), invented by Santa Cruz local David Silvergate. It's a lightweight, sculpted ball made of overlapping rings. It's soft and springy, yet, as Frank says, "you can run it over with a car and it'll be fine." Kids love it, including Frank's 3-year-old grandson. Kaeler, who wins my heart by referring to me as "m'lady," has some gift suggestions for the older crowd. "Games are big sellers," he says, citing this year's Wise and Otherwise ($39.99) as an example. It's a sort of "finish the proverb" game in which players guess the endings to sayings--some of them pretty obscure. Frank asked me a couple and I was totally stumped, but now I kind of want the game. Jigsaw puzzles, he says, are also popular. "People think of a puzzle as something you do alone," he says, "but they're becoming a group activity that people do at parties." All things Lord of the Rings are selling well, including special versions of Risk ($29.99) and Trivial Pursuit ($44.99). A comic book store might not be the first thing people think of when it's time to buy Christmas stuff, but Joe Ferrara from Atlantis Fantasyworld has loads of gift suggestions. There are porcelain figurines, ranging in price from $19 to $35, with such beloved characters as Charlie Brown and his Christmas tree and the Grinch from How The Grinch Stole Christmas, and a snow globe featuring the snowman from Rudolph. Atlantis has an extensive collection of Nightmare Before Christmas paraphernalia. And the pièce de résistance--Neil Gaiman has put out a Christmas card set ($6.95) called "Nicholas Was," based on Gaiman's delightfully dark Santa Claus story from Smoke and Mirrors. The first shipment sold out, but Joe's doing his best to keep them on the shelf. Several comics also have holiday editions. "There's a Walt Disney comic that's a reprint of classic Disney Christmas stories," says Ferrara. The Walt Disney Christmas Parade ($8.95) is a new compilation of some of the old comics that are now collectible--Joe has a few of the originals behind the counter. Also out in time for Christmas are Archie's Classic Christmas Stories ($10.95) and DC Universe Christmas ($19.95). And don't let your tree be left out--Atlantis sells Green Lantern and Batman ornaments ($24.95 each), as well as a beautiful David Mack "Kabuki" ornament ($19.95) that's destined for collectible status.